Have you ever looked at the stuff you're throwing out and thought, "Man, some rodent is going to love this!". Different scavengers all have different preferences for the trash they save from the landfill. A mouse likes to find matchboxes to make into cozy beds, spools of thread used for tables (harder to find these days). While an opossum might prefer scraps of ribbon to make itself feel more approachable, along with apple cores and banana peels. The raccoon is the smartest of all the scavengers. They're stealthy and brave, sifting through the top layer with their dexterous hands to find the last of those chocolate cupcakes that you threw out just so they'd stop staring at you while you ate your oatmeal. When it comes to raccoon life, they pick out the best treasure in the trash. This is the perfect top to any trick-or-treaters raccoon or wildlife costume. The eyes glow with the help of two double A batteries, allowing for better visibility on Halloween night. The soft sculpted face makes this hat into something your child will want to play in, again and again, giving you peace of mind during that neighborhood game of kick the can at dusk. Flashlights can always get left behind. 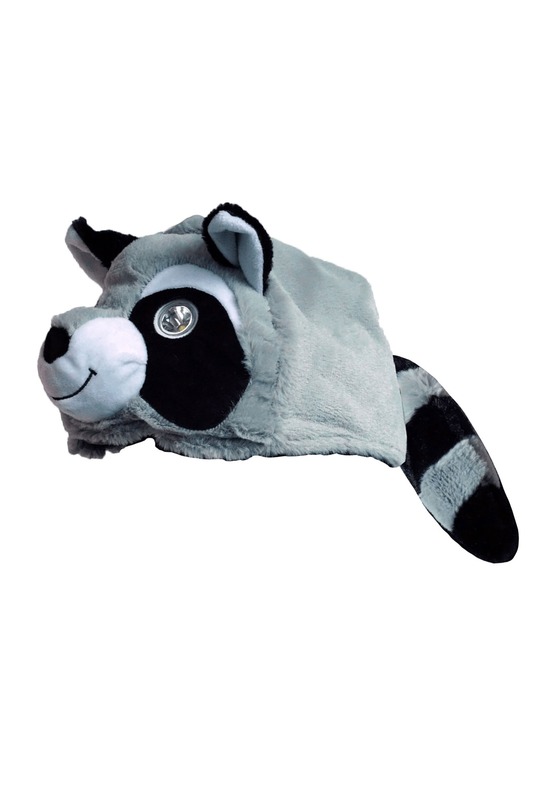 Make sure your kiddo gets seen and stays wild with this adorable raccoon hat. These hats are irresistibly cute! We got several different ones. Make sure you have batteries ready if you are giving as a gift.